"Knockout" is a well-known basketball game kids love playing. You may have heard it called 'elimination', 'lightning', 'bump', or a bunch of other names depending on which corner of the world you're living. 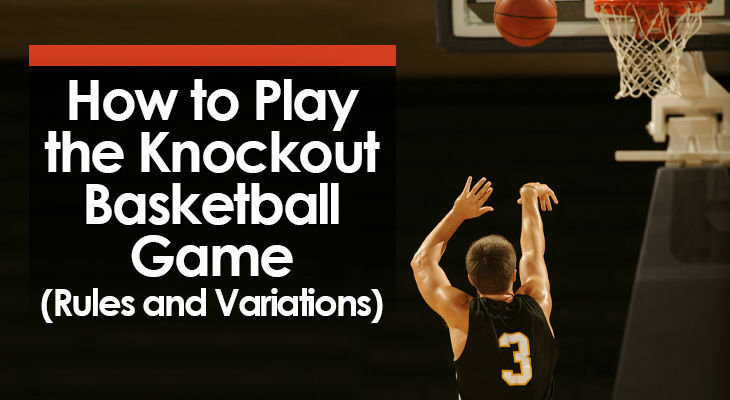 If you've played basketball during school or attended a youth basketball practice, chances are you've played knockout. "Every player gets into a single line. The first two players have a basketball. Players must shoot until they score. If the person behind you scores before you, you’re out. If you score before the player behind you, join the end of the line." Want a more detailed guide on the knockout basketball game? If you want a video of the basketball knockout game in action, here's one by Jr NBA. The main reason coaches and teachers play knockout is for fun. One basketball hoop to shoot on. Two basketballs. The first two players in line each have one. Any number of players in a single file line. 1. To begin the drill, the first player in line shoots from the designated spot. 2. If they miss, the shooter can immediately sprint in, rebound the basketball, and then finish with a layup or close shot around the hoop. 3. As soon as the ball leaves the shooter hands, the second player can shoot the ball. 4. If the first player makes a shot before the second player, then they quickly rebound the ball and pass it back to the next person in line. 5. If the second player makes a shot before the first player, the first player is out. 6. This continues until there's a winner. Shooting Spot Location - Instead of always using the free-throw line, change the spot players are required to initially shoot from. You could make it further away (three-point line) or even closer for the youngest of players. Must Make Distance Shot - Instead of finishing with a layup after a missed shot, players are required to rebound the ball, retreat back to the 'shooting spot' and then shoot again. Left-Handed Finish - If you're coaching advanced players, set a rule that players must finish with their non-preferred hand after missing the first shot. After a missed shot and rebound, make sure players are using the correct hand to make the layup. Don’t allow the players to intentionally miss the first shot so they can get a quick rebound and put it back in. The person next in line should be down in a stance and ready to receive the ball. Once a player scores or gets knocked out, they must pass the basketball to the next player in line as quickly as possible. This drill is meant to be fun for the kids, keep it entertaining! As the coach, don’t be afraid to join in!